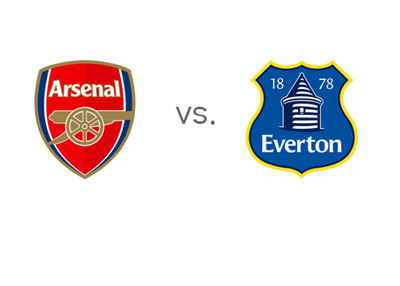 First place Arsenal will host fifth place Everton at the Emirates Stadium in London on Sunday, December 8th, 2013 in the fifteenth round of the English Premier League. This matchup seems to be coming at a perfect time. Both teams are in form, on a winning streak and playing attractive, attacking football. Since losing to Manchester United 1-0 on November 10th, the Gunners have won their next four matches vs. Southampton (2-0), Marseille (2-0), Cardiff City (0-3) and most recently, Hull City (2-0). Everton most recently shocked Manchester United by winning 0-1 at Old Trafford. This famous victory came after a 4-0 win vs. Stoke and a 3-3 draw vs. fourth place Liverpool. Looking back in time, Arsenal have won eight and drew four of the last twelve EPL matches vs. Everton. At home this record is even more impressive. The Gunners won 14 and drew 3 of the last 17. What are the chances of Everton surprising and finally beating the North London side? Arsenal are the huge favourites. A 100 € on Arsenal could yield 70 €, while the same bet on Everton could yield 475 €. The most likely score, according to the odds, is a 1-1 draw, offered at 15/2. Romelu Lukaku, the Belgian international, is a monster this year for Everton and his national side. Arsenal are playing so well it is beautiful. It's the game to watch on Sunday for sure!